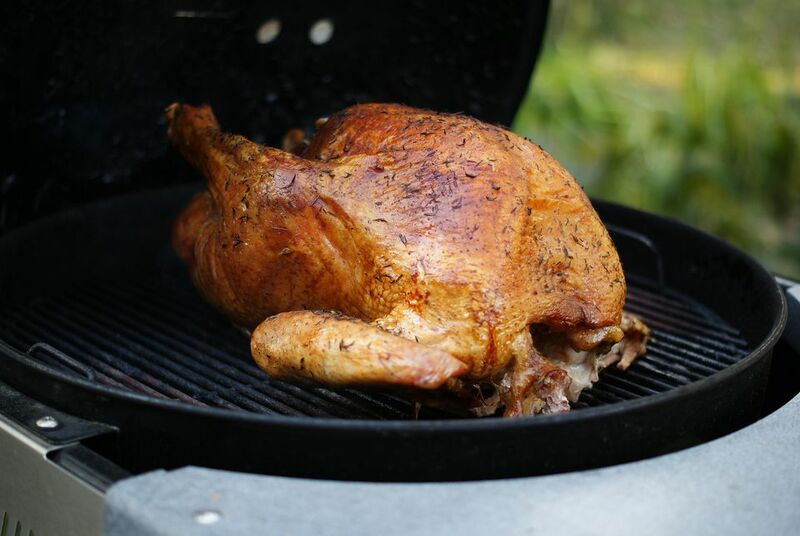 Are you interested in making a smoked turkey but don't have a smoker? No worries–use your grill to slow-roast this tasty bird and it will be just as tender and delicious. Combine apple juice, brown sugar, and salt in a large saucepan. Bring to a boil and continue heating until the sugar and salt have dissolved. In a large (five-gallon or larger) stockpot or similar container, combine the apple juice mixture with three quarts of water, oranges, ginger, cloves, bay leaves, and garlic. Wash the turkey. Remove any fatty deposit you might find and everything from the body cavity. Place turkey in brine mixture and refrigerate for 24 hours. Make sure that the turkey remains completely submerged. Place hickory chips in water and prepare grill for indirect grilling on a medium heat. Remove turkey from brine and pat dry with paper towels. Tie legs together with string and lightly brush turkey with vegetable oil. Preheat your grill to about 325 F/165 C. Place turkey on a roasting rack inside a foil pan. Place on the grill away from direct heat. After 30 to 40 minutes, you will need to wrap the wings in foil to keep them from burning. Brush with vegetable oil periodically. If the breasts start to get too brown, cover with foil. The smoked turkey is done when the internal temperature reaches about 175 F/80 C in the thigh or about 165 F/75 C in the breast. You should expect it to take about 12 to 14 minutes per pound. When done, remove from grill and let rest for about 15 minutes.